With craggy shorelines, volcanic mountains, and high sage deserts, the Northwest’s complex and varied topography contributes to the region’s rich climatic, geographic, social, and ecologic diversity. Abundant natural resources – timber, fisheries, productive soils, and plentiful water – remain important to the region’s economy. Adding to the influence of climate, human activities have altered natural habitats, threatened species, and extracted so much water that there are already conflicts among multiple users in dry years. More recently, efforts have multiplied to balance environmental restoration and economic growth while evaluating climate risks. As conflicts and tradeoffs increase, the region’s population continues to grow, and the regional consequences of climate change continue to unfold. The need to seek solutions to these conflicts is becoming increasingly urgent. Temperatures increased across the region from 1895 to 2011, with a regionally averaged warming of about 1.3°F.1 While precipitation has generally increased, trends are small as compared to natural variability. Both increasing and decreasing trends are observed among various locations, seasons, and time periods of analysis (Ch. 2: Our Changing Climate, Figure 2.12). Studies of observed changes in extreme precipitation use different time periods and definitions of “extreme,” but none find statistically significant changes in the Northwest.2,3,4 These and other climate trends include contributions from both human influences (chiefly heat-trapping gas emissions) and natural climate variability, and consequently are not projected to be uniform or smooth across the country or over time (Ch. 2: Our Changing Climate, Key Message 3). They are also consistent with expected changes due to human activities (Ch. 2: Our Changing Climate, Key Message 1). Ongoing research on the implications of these and other changes largely confirms projections and analyses made over the last decade, while providing more information about how climate impacts are likely to vary from place to place within the region. In addition, new areas of concern, such as ocean acidification, have arisen. The author team identified potential regional impacts by 1) working forward from drivers of regional climate impacts (for example, changes in temperature, precipitation, sea level, ocean chemistry, and storms), and 2) working backward from affected regional sectors (for example, agriculture, natural systems, and energy). The team identified and ranked the relative consequences of each impact for the region’s economy, infrastructure, natural systems, and the health of Northwest residents. The likelihood of each impact was also qualitatively ranked, allowing identification of the impacts posing the highest risk, that is, likelihood × consequence, to the region as a whole. The key regionally consequential risks thus identified are those deriving from projected changes in streamflow timing (in particular, warming-related impacts in watersheds where snowmelt is an important contributor to flow); coastal consequences of the combined impact of sea level rise and other climate-related drivers; and changes in Northwest forest ecosystems. The Northwest chapter therefore focuses on the implications of these risks for Northwest water resources, key aquatic species, coastal systems, and forest ecosystems, as well as climate impacts on the regionally important, climate-sensitive agricultural sector. Though the risks evaluated were aggregated over the whole region, it was recognized that impacts, risks, and appropriate adaptive responses vary significantly in local settings. For all sectors, the focus on risks of importance to the region’s overall economy, ecology, built environment, and health is complemented, where space allows, by discussion of the local specificity of climate impacts, vulnerabilities and adaptive responses that results from the heterogeneity of Northwest physical conditions, ecosystems, human institutions and patterns of resource use. This message was selected because of the centrality of the water cycle to many important human and natural systems of the Northwest: hydropower production and the users of this relatively inexpensive electricity; agriculture and the communities and economies dependent thereon, and; coldwater fish, including several species of threatened and endangered salmon, the tribal and fishing communities and ecosystems that depend on them, and the adjustments in human activities and efforts necessary to restore and protect them. Impacts of water-cycle changes on these systems, and any societal adjustments to them, will have far-reaching ecological and socioeconomic consequences. Evidence that winter snow accumulation will decline under projected climate change is based on 20th century observations and theoretical studies of the sensitivity of Northwest snowpack to changes in precipitation and temperature. There is good agreement on the physical role of climate in snowpack development, and projections of the sign of future trends are consistent (many studies). However, climate variability creates disagreement over the magnitude of current and near-term future trends. Evidence that projected climate change would shift the timing and amount of streamflow deriving from snowmelt is based on 20th century observations of climate and streamflow and is also based on hydrologic model simulation of streamflow responses to climate variability and change. There is good agreement on the sign of trends (many studies), though the magnitude of current and near-term future trends is less certain because of climate variability. policy and institutional analyses of the complex legal and institutional arrangements governing Northwest water management and the challenges associated with adjusting water management in response to changing conditions. legal requirements to manage water resources for threatened & endangered fish as well as for human uses. institutional and policy analyses documenting sources and types of management rigidity (for example, difficulty adjusting management practices to account for changing conditions). A key uncertainty is the degree to which current and future interannual and interdecadal variations in climate will enhance or obscure long-term anthropogenic climate trends. Uncertainty over local groundwater or glacial inputs and other local effects may cause overestimates of increased stream temperature based solely on air temperature. However, including projected decreases in summer streamflow would increase estimates of summer stream temperature increases above those based solely on air temperature. Uncertainty in how much increasing temperatures will affect crop evapotranspiration affects future estimates of irrigation demand. Uncertainty in future population growth and changing per capita water use affects estimates of future municipal demand and therefore assessments of future reliability of water resource systems. A major uncertainty is the degree to which water resources management operations of regulated systems can be adjusted to account for climate-driven changes in the amount and timing of streamflow, and how competing resource objectives will be accommodated or prioritized. Based on current institutional inertia, significant changes are unlikely to occur for several decades. There is uncertainty in economic assessment of the impacts of hydrologic changes on the Northwest because much of the needed modeling and analysis is incomplete. Economic impacts assessment would require quantifying both potential behavioral responses to future climate-affected economic variables (prices of inputs and products) and to climate change itself. Some studies have sidestepped the issue of behavioral response to these and projected economic impacts based on future scenarios that do not consider adaptation, which lead to high estimates of “costs” or impacts. Confidence is very high based on strong strength of evidence and high level of agreement among experts. See specifics under “description of evidence” above. Changes in river-related flood risk depends on many factors, but warming is projected to increase flood risk the most in mixed basins (those with both winter rainfall and late spring snowmelt-related runoff peaks) and remain largely unchanged in snow-dominant basins.30 Regional climate models project increases of 0% to 20% in extreme daily precipitation, depending on location and definition of “extreme” (for example, annual wettest day). Averaged over the region, the number of days with more than one inch of precipitation is projected to increase 13% in 2041 to 2070 compared with 1971 to 2000 under a scenario that assumes a continuation of current rising emissions trends (A2),1 though these projections are not consistent across models.31 This increase in heavy downpours could increase flood risk in mixed rain-snow and rain-dominant basins, and could also increase stormwater management challenges in urban areas. Given the extent of the coastline, the importance of coastal systems to the region’s ecology, economy, and identity, and the difficulty of adapting in response, the consequences of sea level rise, ocean acidification, and other climate driven changes in ocean conditions and coastal weather are expected to be significant and largely negative, which is why this message was included. Evidence of erosion associated with coastal storms is based on observations of storm damage in some areas of the Northwest. Evidence for erosion and inundation associated with projected sea level rise is based on observations and mapping of coastal elevations and geospatial analyses of the extent and location of inundation associated with various sea level rise and storm surge scenarios. Evidence for climate change impacts on coastal infrastructure derives from geospatial analyses (mapping infrastructure locations likely to be affected by various sea level rise scenarios, storm surge scenarios and/or river flooding scenario), such as those undertaken by various local governments to assess local risks of flooding for the downtown area (Olympia), of sea level rise and storm surge for marine shoreline inundation and risk to public utility infrastructure (Seattle – highest observed tide from NOAA tide gauge added to projected sea levels), and of sea level rise for wastewater treatment plants and associated infrastructure (King County). 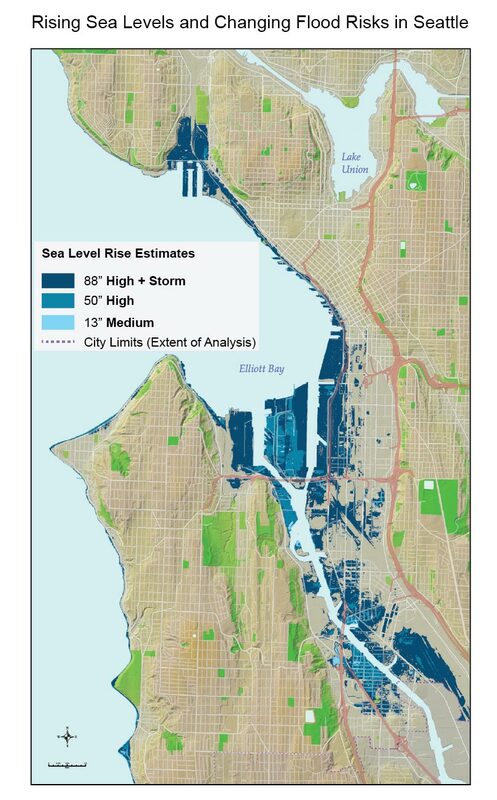 Vulnerability of coastal transportation infrastructure to climate change has been assessed by combining geospatial risk analyses with expert judgment of asset sensitivity to climate risk and criticality to the transportation system in Washington State and by assessing transportation infrastructure exposure to climate risks associated with sea level rise and river flooding in the region as a whole. observed changes in the geographic ranges, migration timing, and productivity of marine species due to changes in sea surface temperatures associated with cyclical events, such as the interannual El Niño Southern Oscillation and the inter-decadal Pacific Decadal Oscillation and North Pacific Gyre Oscillation. Evidence for historical increases in ocean acidification is from observations of changes in coastal ocean conditions, which also indicate high spatial and temporal variability. Evidence for acidification’s effects on various species and the broader marine food web is still emerging but is based on observed changes in abundance, size, and mortality of marine calcifying organisms and laboratory based and in situ acidification experiments. Evidence for marine species responses to climate change derives from observations of shifts in marine plankton, fish, and seabird species associated with historical changes in ocean conditions, including temperature and availability of preferred foods. Evidence for low adaptive capacity is from observations of extent of degraded or fragmented coastal habitat, existence of few options for mitigating changes in marine chemical properties, observed extent of barriers to inland habitat migration, narrow coastal transportation corridors, and limited transportation alternatives for rural coastal towns. Evidence for low adaptive capacity is also based on the current limitations (both legal and political) of local and state governments to restrict and/or influence shoreline modifications on private lands. There is significant but well-characterized uncertainty about the rate and extent of future sea level rise at both the global and regional/sub-regional scales. However, there is virtually no uncertainty in the direction (sign) of global sea level rise. There is also a solid understanding of the primary contributing factors and mechanisms causing sea level rise. Other details concerning uncertainty in global sea level rise are treated elsewhere (for example, NRC 201253) and in Ch. 2: Our Changing Climate). Regional uncertainty in projected Northwest sea level rise results primarily from global factors such as ice sheet mass balance and local vertical land movement (affecting relative sea level rise). An accurate determination of vertical land deformation requires a sufficient density of monitoring sites (for example, NOAA tide gauges and permanent GPS sites that monitor deformation) to capture variations in land deformation over short spatial scales, and in many Northwest coastal locations such dense networks do not exist. There is a general trend, however, of observed uplift along the northwestern portion of the Olympic Peninsula and of subsidence within the Puget Sound region (GPS data gathered from PBO data sets -- http://pbo.unavco.org/data/gps; see also Chapman and Melbourne 200955). There is also considerable uncertainty about potential impacts of climate change on processes that influence storminess and affect coastal erosion in the Northwest. These uncertainties relate to system complexity and the limited number of studies and lack of consensus on future atmospheric and oceanic conditions that will drive changes in regional wind fields. Continued collection and assessment of meteorological data at ocean buoy locations and via remote sensing should improve our understanding of these processes. Uncertainty in future patterns of sediment delivery to the coastal system limit projections of future inundation, erosion, and changes in tidal marsh. For example, substantial increases in riverine sediment delivery, due to climate-related changes in the amount and timing of streamflow, could offset erosion and/or inundation projected from changes in sea level alone. However, there are areas in the Northwest where it is clear that man-made structures have interrupted sediment supply and there is little uncertainty that shallow water habitat will be lost. Although relatively well-bounded, uncertainty over the rate of projected relative sea level rise limits our ability to assess whether any particular coastal habitat will be able to keep pace with future changes through adaptation (for example, through accretion). The specific implications of the combined factors of sea level rise, coastal climate change, and ocean acidification for coastal ecosystems and specific individual species remain uncertain due to the complexity of ecosystem response. However, there is general agreement throughout the peer-reviewed literature that negative impacts for a number of marine calcifying organisms are projected, particularly during juvenile life stages. Projections of future coastal ocean conditions (for example, temperature, nutrients, pH, and productivity) are limited, in part, by uncertainty over future changes in upwelling – climate model scenarios show inconsistent projections for likely future upwelling conditions. Considerable uncertainty also remains in whether, and how, higher average ocean temperatures will influence geographical ranges, abundances, and diversity of marine species, although evidence of changes in pelagic fish species ranges and in production associated with Pacific Ocean temperature variability during cyclical events have been important indicators for potential species responses to climate change in the future. Consequences from ocean acidification for commercial fisheries and marine food web dynamics are potentially very high – while the trend of increasing acidification is very likely, the rate of change and spatial variability within coastal waters are largely unknown and are the subject of ongoing and numerous nascent research efforts. Additional uncertainty surrounds non-climate contributors to coastal ocean chemistry (for example, riverine inputs, anthropogenic carbon, and nitrogen point and non-point source inputs) and society’s ability to mitigate these inputs. There is very high confidence in the global upward trend of sea level rise (SLR) and ocean acidification (OA). There is high confidence that SLR over the next century will remain under an upper bound of approximately 2 meters. Projections for SLR and OA at specific locations are much less certain (medium to low) because of the high spatial variability and multiple factors influencing both phenomena at regional and sub-regional scales. There is medium confidence in the projections of species response to sea level rise and increased temperatures, but low confidence in species response to ocean acidification. Uncertainty in upwelling changes result in low confidence for projections of future change that depend on specific coastal ocean temperatures, nutrient contents, dissolved oxygen content, stratification, and other factors. There is high confidence that significant changes in the type and distribution of coastal marsh habitat are likely, but low confidence in our current ability to project the specific location and timing of changes. There is high confidence in the projections of increased erosion and inundation. There is very high confidence that ocean acidity will continue to increase. With diverse landforms (such as beaches, rocky shorelines, bluffs, and estuaries), coastal and marine ecosystems, and human uses (such as rural communities, dense urban areas, international ports, and transportation), the Northwest coast will experience a wide range of climate impacts. Global sea levels have risen about 8 inches since 1880 and are projected to rise another 1 to 4 feet by 2100 (Ch. 2: Our Changing Climate, Key Message 10). Many local and regional factors can modify the global trend, including vertical land movement, oceanic winds and circulation, sediment compaction, subterranean fluid withdrawal (such as groundwater and natural gas), and other geophysical factors such as the gravitational effects of major ice sheets and glaciers on regional ocean levels. 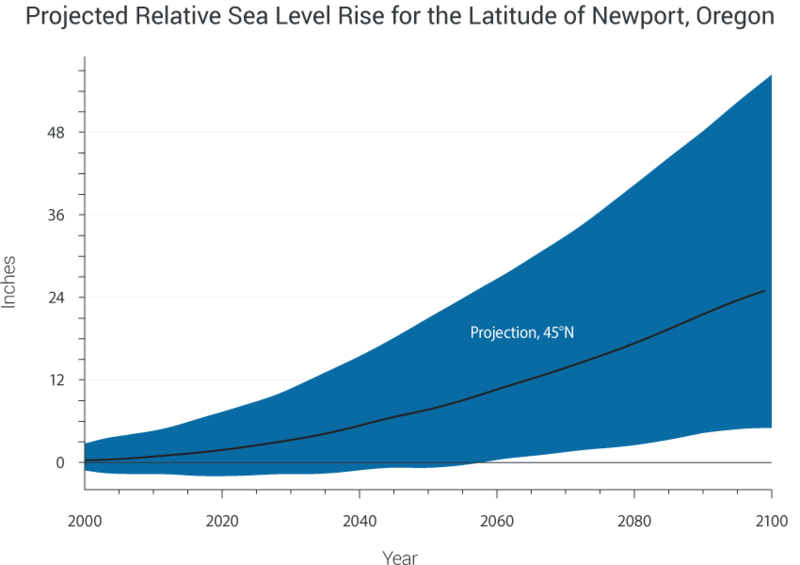 Figure 21.3: Projected relative sea level rise for the latitude of Newport, Oregon (relative to the year 2000) is based on a broader suite of emissions scenarios (ranging from B1 to A1FI) and a more detailed and regionally-focused calculation than those generally used in this assessment (see Ch. 2: Our Changing Climate).53 The blue area shows the range of relative sea level rise, and the black line shows the projection, which incorporates global and regional effects of warming oceans, melting land ice, and vertical land movements.53 Given the difficulty of assigning likelihood to any one possible trajectory of sea level rise at this time, a reasonable risk assessment would consider multiple scenarios within the full range of possible outcomes shown, in conjunction with long- and short-term compounding effects, such as El Niño-related variability and storm surge. (Data from NRC 201253). Many human uses of the coast – for living, working, and recreating – will also be negatively affected by the physical and ecological consequences of climate change. Erosion, inundation, and flooding will threaten public and private property along the coast; infrastructure, including wastewater treatment plants;91,92 stormwater outfalls;93,94 ferry terminals;95 and coastal road and rail transportation, especially in Puget Sound.96 Municipalities from Seattle93 and Olympia,94 Washington, to Neskowin, Oregon, have mapped risks from the combined effects of sea level rise and other factors. Evidence that the interannual variation in area burned was at least partially controlled by climate during the period 1980-2010 is also strong. Statistical analysis has shown that increased temperature (related to increased potential evapotranspiration, relative humidity, and longer fire seasons) and decreased precipitation (related to decreased actual evapotranspiration, decreased spring snowpack, and longer fire seasons) are moderate to strong (depending on forest type) correlates to the area and number of fires in the Pacific Northwest. Projections of area burned with climate change are documented in peer-reviewed literature, and different approaches (statistical modeling and dynamic global vegetation modeling) agree on the order of magnitude of those changes for Pacific Northwest forests, though the degree of increase depends on the climate change scenario and modeling approach. 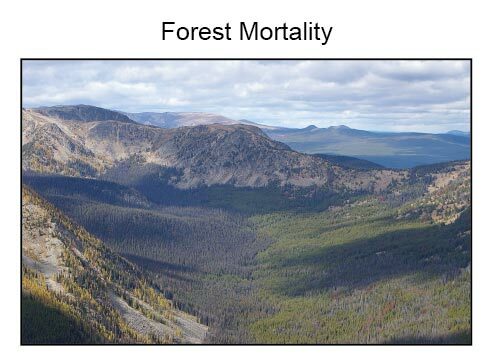 Evidence from aerial disease and detection surveys jointly coordinated by the U.S. Forest Service and state level governments supports the statement that the area of forest mortality caused by insect outbreaks (including the mountain pine beetle) and by tree diseases is increasing. Evidence that mountain pine beetle and spruce bark beetle outbreaks are climatically controlled is from a combination of laboratory experiments and mathematical modeling reported in peer-reviewed literature. Peer-reviewed future projections of climate have been used to develop projections of mountain pine beetle and spruce beetle habitat suitability based on these models, and show increases in the area of climatically suitable habitat (particularly at mid- to high elevations) by the mid-21st century, but subsequent (late 21st century) declines in suitable habitat, particularly at low- to mid-elevation. There is considerable spatial variability in the patterns of climatically suitable habitat. Evidence for long-term changes in the distribution of vegetation types and tree species comes from statistical species models, dynamic vegetation models, and other approaches and uses the correlation between observed climate and observed vegetation distributions to model future climatic suitability. These models agree broadly in their conclusions that future climates will be unsuitable for historically present species over significant areas of their ranges and that broader vegetation types will likely change, but the details depend greatly on climate change scenario, location within the region, and forest type. Evidence that subalpine forests are likely to undergo almost complete conversion to other vegetation types is moderately strong (relatively few studies, but good agreement) and comes from dynamic global vegetation models that include climate, statistical models that relate climate and biome distribution, and individual statistical species distribution models based on climatic variables. The fact that these three different approaches generally agree about the large decrease in area of subalpine forests despite different assumptions, degrees of “mechanistic” simulation, and levels of ecological hierarchy justifies the key message. The key uncertainties are primarily the timing and magnitude of future projected changes in forests, rather than the direction (sign) of changes. The rate of expected change is affected by the rate of climate change – higher emissions scenarios have higher impacts earlier in studies that consider multiple scenarios. Most impacts analyses reported in the literature and synthesized here use emissions scenario A1B or A2. Projections of changes in the proportion of Northwest pine forests where mountain pine beetles are likeliest to survive and of potential conversion of subalpine forests used scenario A2. Statistical fire models do not include changes in vegetation that occur in the 21st century due to disturbance (such as fire, insects, and tree diseases) and other factors such as land-use change and fire suppression changes. As conditions depart from the period used for model training, projections of future fire become more uncertain, and by the latter 21st century (beyond about the 2060s to 2080s), statistical models may over-predict area burned. Despite this uncertainty, the projections from statistical models are broadly similar to those from dynamic global vegetation models (DGVMs), which explicitly simulate changes in future vegetation. A key difference is for forest ecosystems where fire has been rare since the mid 20th century, such as the Olympic Mountains and Oregon coast range, and statistical models are comparatively weak. In these systems, statistical fire models likely underestimate the future area burned, whereas DGVMs may capably simulate future events that are outside the range of the statistical model’s capability. In any case, an increase in forest area burned is nearly ubiquitous in these studies regardless of method, but the amount of increase and the degree to which it varies with forest type is less certain. However, fire risk in any particular location or at any particular time is beyond the capability of current model projections. In addition, the statistical model approaches to future fire cannot address fundamental changes in fire behavior due to novel extreme weather patterns, so conclusions about changes in fire severity are not necessarily warranted. Only a few insects have had sufficient study to understand their climatic linkages, and future insect outbreak damage from other insects, currently unstudied, could increase the estimate of future areas of forest mortality due to insects. Fire-insect interactions and diseases are poorly studied – the actual effects on future landscapes could be greater if diseases and interactions were considered more explicitly. For subalpine forests, what those forests become instead of subalpine forests is highly uncertain – different climate models used to drive the same dynamic global vegetation model agree about loss of subalpine forests, but disagree about what will replace them. In addition, statistical approaches that consider biome level and species level responses without the ecological process detail of DGVMs show similar losses, but do not agree on responses, which depend on climate scenarios. Because these statistical models simulate neither the regeneration of seedlings nor the role of disturbances, the future state of the system is merely correlative and based on the statistical relationship between climate and historical forest distribution. 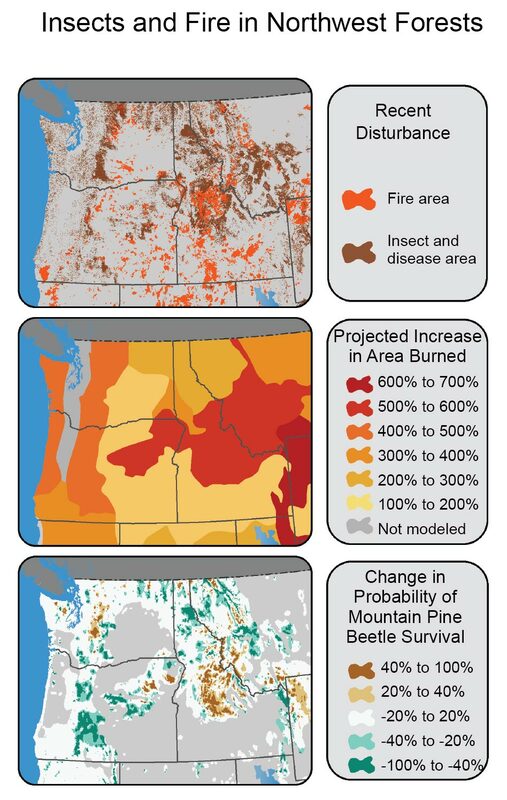 The observed effects of climate on fires and insects combined with the agreement of future projections across modeling efforts warrants very high confidence that increased disturbance will increase forest mortality due to area burned by fire, and increases in insect outbreaks also have very high confidence until at least the 2040s in the Northwest. The timing and nature of the rates and the sources of mortality may change, but current estimates may be conservative for insect outbreaks due to the unstudied impacts of other insects. But in any case, the rate of projected forest disturbance suggests that changes will be driven by disturbance more than by gradual changes in forest cover or species composition. After mid-21st century, uncertainty about the interactions between disturbances and landscape response limits confidence to high because total area disturbed could begin to decline as most of the landscape becomes outside the range of historical conditions. The fact that different modeling approaches using a wide variety of climate scenarios indicate similar losses of subalpine forests justifies high confidence; however, comparatively little research that simulates ecological processes of both disturbance and regeneration as a function of climate, so there is low confidence on what will replace them. Evergreen coniferous forests are a prominent feature of Northwest landscapes, particularly in mountainous areas. Forests support diverse fish and wildlife species, promote clean air and water, stabilize soils, and store carbon. They support local economies and traditional tribal uses and provide recreational opportunities. Climate change will alter Northwest forests by increasing wildfire risk and insect and tree disease outbreaks, and by forcing longer-term shifts in forest types and species (see Ch 7: Forests). Many impacts will be driven by water deficits, which increase tree stress and mortality, tree vulnerability to insects, and fuel flammability. The cumulative effects of disturbance – and possibly interactions between insects and fires – will cause the greatest changes in Northwest forests.112,113 A similar outlook is expected for the Southwest region (see Ch. 20: Southwest, Key Message 3). Although wildfires are a natural part of most Northwest forest ecosystems, warmer and drier conditions have helped increase the number and extent of wildfires in western U.S. forests since the 1970s.7,113,114,115 This trend is expected to continue under future climate conditions. By the 2080s, the median annual area burned in the Northwest would quadruple relative to the 1916 to 2007 period to 2 million acres (range of 0.2 to 9.8 million acres) under the A1B scenario. Averaged over the region, this would increase the probability that 2.2 million acres would burn in a year from 5% to nearly 50%.7 Within the region, this probability will vary substantially with sensitivity of fuels to climatic conditions and local variability in fuel type and amount, which are in turn a product of forest type, effectiveness of fire suppression, and land use. For example, in the Western Cascades, the year-to-year variability in area burned is difficult to attribute to climate conditions, while fire in the eastern Cascades and other specific vegetation zones is responsive to climate.7 How individual fires behave in the future and what impacts they have will depend on factors we cannot yet project, such as extreme daily weather and forest fuel conditions. Ability to prepare for these changes varies with land ownership and management priorities. Adaptation actions that decrease forest vulnerability exist, but none is appropriate across all of the Northwest’s diverse climate threats, land-use histories, and management objectives.112,129,130 Surface and canopy thinning can reduce the occurrence and effects of high severity fire in currently low severity fire systems, like drier eastern Cascades forests,131,132 but may be ineffective in historically high-severity-fire forests, like the western Cascades, Olympics, and some subalpine forests. It is possible to use thinning to reduce tree mortality from insect outbreaks,112,133 but not on the scale of the current outbreaks in much of the West. Northwest agriculture’s sensitivity to climate change stems from its dependence on irrigation water, adequate temperatures, precipitation and growing seasons, and the sensitivity of crops to temperature extremes. Projected warming trends based on global climate models and emissions scenarios potentially increase temperature-related stress on annual and perennial crops in the summer months. Evidence for projected impacts of warming on crop yields consists primarily of published studies using crop models indicating increasing vulnerability with projected warming over 1975-2005 baselines. These models also project that thermal-stress-related losses in agricultural productivity will be offset or overcompensated by fertilization from accompanying increases in atmospheric CO2. These models have been developed for key commodities including wheat, apples, and potatoes. Longer term, to end of century, models project crop losses from temperature stress to exceed the benefits of CO2 fertilization. Evidence for the effects of warming on suitability of parts of the region for specific wine grape and tree fruit varieties are based on well-established and published climatic requirements for these varieties. Evidence for negative impacts of increased variability of precipitation on livestock productivity due to stress on range and pasture consists of a few economic studies in states near the region; relevance to Northwest needs to be established. Evidence for negative impacts of warming on dairy production in the region is based on a published study examining projected summer heat-stress on milk production. Evidence for reduction in available irrigation water is based on peer-reviewed publications and state and federal agency reports utilizing hydrological models and precipitation and snowpack projections. These are outlined in more detail in the traceable account for Key Message 1 of this chapter. Increased demands for irrigation water with warming are based on cropping systems models and projected increases in acres cultivated. These projections, coupled with those for water supply, indicate that some areas will experience increased water shortages. Water rights records allow predictions of the users most vulnerable to the effects of these shortages. 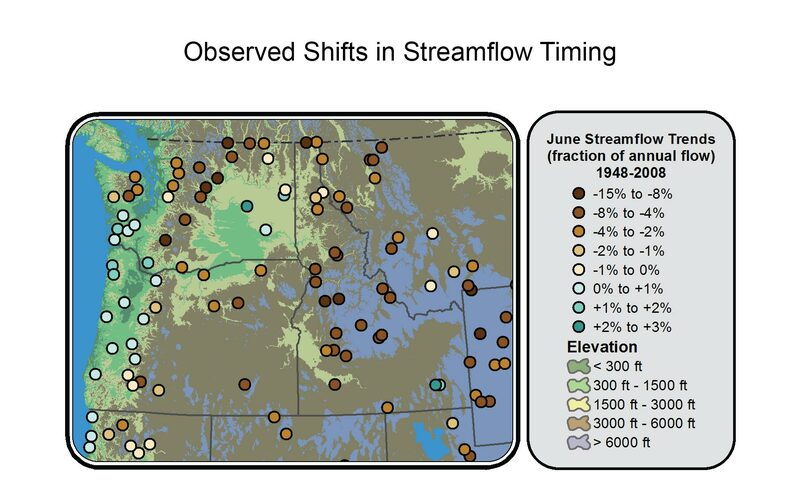 Projections for surface water flows include decreases in summer flow related to changes in snowpack dynamics and reductions in summer precipitation. Although these precipitation projections are less certain than those concerning temperatures, they indicate that water shortages for irrigation will be more frequent in some parts of the region, based especially on a Washington State Department of Ecology-sponsored report that considered the Columbia basin. Other evidence for these projected changes in water is itemized in Key Message 1 of this chapter. Evidence that agriculture has a high potential for autonomous adaptation to climate change, assuming adequate water availability, is inferred primarily from the wide range of production practices currently being used across the varied climates of the region. Although increasing temperatures can affect the distribution of certain pest, weed, and pathogen species, existing models are limited. Without more comprehensive studies, it is not possible to project changes in overall pressure from these organisms, so overall effects remain uncertain. Some species may be adversely affected by warming directly or through enhancement of their natural enemy base, while others become more serious threats. Uncertainty exists in models in how increasing temperatures will impact crop evapotranspiration, which affects future estimates of irrigation demand (Key Message 1 of this chapter). Shifting international market forces including commodity prices and input costs, adoption of new crops, which may have different heat tolerance or water requirements, and technological advances are difficult or impossible to project, but may have substantial effects on agriculture’s capacity to adapt to climate change. Estimates of changes in crop yields as a result of changing climate and CO2 are based on very few model simulations, so the uncertainty has not been well quantified. Agriculture provides the economic and cultural foundation for Northwest rural populations and contributes substantively to the overall economy. Agricultural commodities and food production systems contributed 3% and 11% of the region’s gross domestic product, respectively, in 2009.134,135,136,137 Although the overall consequences of climate change will probably be lower in the Northwest than in certain other regions, sustainability of some Northwest agricultural sectors is threatened by soil erosion138,139 and water supply uncertainty, both of which could be exacerbated by climate change. Northwest agriculture’s sensitivity to climate change stems from its dependence on irrigation water, a specific range of temperatures, precipitation, and growing seasons, and the sensitivity of crops to temperature extremes. Projected warming will reduce the availability of irrigation water in snowmelt-fed basins and increase the probability of heat stress to field crops and tree fruit. Some crops will benefit from a longer growing season140 and/or higher atmospheric carbon dioxide, at least for a few decades.140,141 Longer-term consequences are less certain. Changes in plant diseases, pests, and weeds present additional potential risks. Higher average temperatures generally can exacerbate pest pressure through expanded geographic ranges, earlier emergence or arrival, and increased numbers of pest generations (for example, Ch. 6: Agriculture).142,143 Specifics differ among pathogen and pest species and depend upon multiple interactions (Ch. 6: Agriculture)144 preventing region-wide generalizations. Research is needed to project changes in vulnerabilities to pest, disease, and weed complexes for specific cropping systems in the Northwest. Irrigated apple production is projected to increase in Washington State by 6% in the 2020s, 9% in the 2040s, and 16% in the 2080s (relative to 1975 to 2005) when offsetting effects of carbon dioxide fertilization are included.140 However, because tree fruit requires chilling to ensure uniform flowering and fruit set and wine grape varieties have specific chilling requirements for maturation,146 warming could adversely affect currently grown varieties of these commodities. Most published projections of climate change impacts on Northwest agriculture are limited to Washington State and have focused on major commodities, although more than 300 crops are grown in the region. More studies are needed to identify the implications of climate change for additional cropping systems and locations within the region. The economic consequences for Northwest agriculture will be influenced by input and output prices driven by global economic conditions as well as by regional and local changes in productivity.